Dedicated to improving patient’s lives through advanced, cutting-edge orthopaedic care while never forgetting personalized, compassionate service. Our goal is to provide thoughtful, individualized treatment using literature based knowledge and a conservative common sense approach. Dr. Heinen has gone above and beyond in caring for my mother in law. His ortho knowledge is extensive and he has genuine concern for his patients. I highly recommend Dr. Heinen. My wife is seeing Dr. Heinen for a cervical spine related issue. I like his conservative approach, he is not one to jump into risky treatments before exploring the safer options. He’s very outgoing and a good listener. Makes sure you have a good understanding of the treatment before you leave his office. He’s my sport medicine doctor. Since I didn’t have a recommendation on a doctor I used the time honor tradition of ranking doctors based on where they went to school. (Heinen graduated from USC and Yale). All in all, he’s quick, fast and efficient. I like it. Dr. Heinen was recommended to me by my longtime orthopedic surgeon, Jerry Wall of Riverside Sport Clinic, just before his tragic passing a couple years ago. I had torn both rotator cuffs in a work accident and Dr. Heinen surgically repaired them, first one, then PT, then the other, then PT. Let me say that both of my shoulders are now perfect, as though I’m 20 years old and never got hurt. 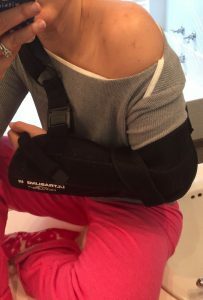 With a youth spent riding and a 14 year career racing professional motocross, my shoulders were about the only thing I had never injured, or had surgery on. Sure, I’d broken my collarbones five on the left and three on the right, but never my shoulders. So I know all about surgeries and have been lucky to have had Dr. Wall do my knees and Heinen do my shoulders. I highly recommend Dr. Heinen for any shoulder related injuries. Thank you Dr. Heinen & Maher for helping my 7 year old son who broke his arm over the weekend. They took care of my son & made sure he wasn’t stressed out. Dr. Heinen is very informative & took care of my kid like he was family. I was so worried sick about my son’s arm but Dr. Heinen is efficient. It’s a pretty busy office but urgent circumstances like this, they were kind enough to take my son in and took care of his injury. I am very thankful for Dr. Heinen and his team! I had rotator cuff surgery done on 11/1/16. I was previously scheduled to have it done with another surgeon through workers comp. I had a very uneasy feeling about the other doctor. He rushed through he appointments and was somewhat rude. Come to find out, he had very bad reviews. I have had the opposite experience with Dr. Heinen, Marie and Maher. Also Mary Hellen whom I’ve only spoken to on the phone. All are beyond amazing people! I am am so thankful that I went with my gut and requested a new doctor. Thank you Dr. Heinen.